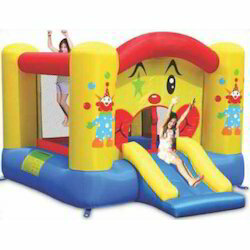 Prominent & Leading Wholesale Trader from Noida, we offer adventure combo bouncy castle, 13 in 1 bouncy castle, jungle fun, mega slide combo, bubble 4 in 1 play center and clown hoop bouncer. 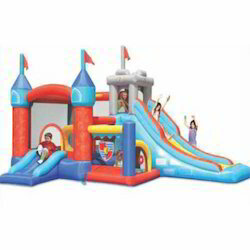 Item Size 13 X 9 X 6.5 FT.
Used Area 16.5 X 12.5 FT.
We are offering an exclusive collection of Adventure Combo Bouncy Castle that is available in different sizes and colors. 30 PLASTIC PLAYING POOL BALLS FREE WITH IT. 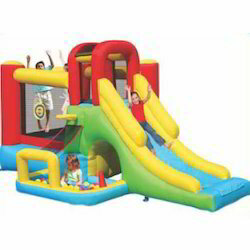 Our organization has successfully expanded its business in market owing to the offered elevated quality array of Bouncy Castle. 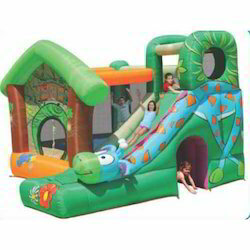 Item Size 11.5 X 11 X 8 FT.
Used Area 15 X 14.5 FT.
We are an affluent organization, offering a superior quality array of Jungle Fun. We are providing our esteemed clients a classy range of Mega Slide Combo. 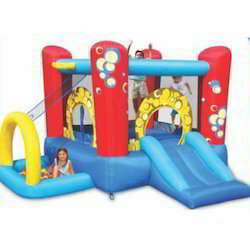 Item Size 10 x 9 x 5.7 ft.
Used Area 13.5 x 12.5 ft.
With the constant support of our dexterous crew of professionals, we are fulfilling the varied requirements of clients by offering optimum quality Bubble 4 In 1 Play Center. We have emerged as a leading organization, engaged in offering superior quality Clown Hoop Bouncer. Looking for Kids Inflatable ?